Snake Watch 2017 has come to an end. Sam, the 17-foot python missing in the Matanuska Valley's Meadow Lakes neighborhood since April 24, was found slithering across his owner's living room on Monday afternoon. David Hyde, Sam's owner, said he was outside working on his property and left his front door open. When he went back inside, Sam had returned. "I decided he was gone forever, and I thought it'd be OK to leave my door open so I could come and go as I was working on chores," Hyde said. "And there he was." When asked if he knew where Sam had disappeared to, or if the snake had gone far, Hyde said he wasn't sure. Hyde said he searched the neighborhood thoroughly. Hyde said he believes the snake had been outside. A couple of dirtied lines on Sam's body appeared to be roofing tar, he said shortly before putting the phone down to place Sam in a filled bathtub. Sam appears to have not eaten since leaving the home two weeks ago, according to Hyde. The snake generally has a lump in the middle of his body when he finishes a meal, he said. The pet snake will likely stay locked in a room from now on. Sam has his own room, Hyde said. 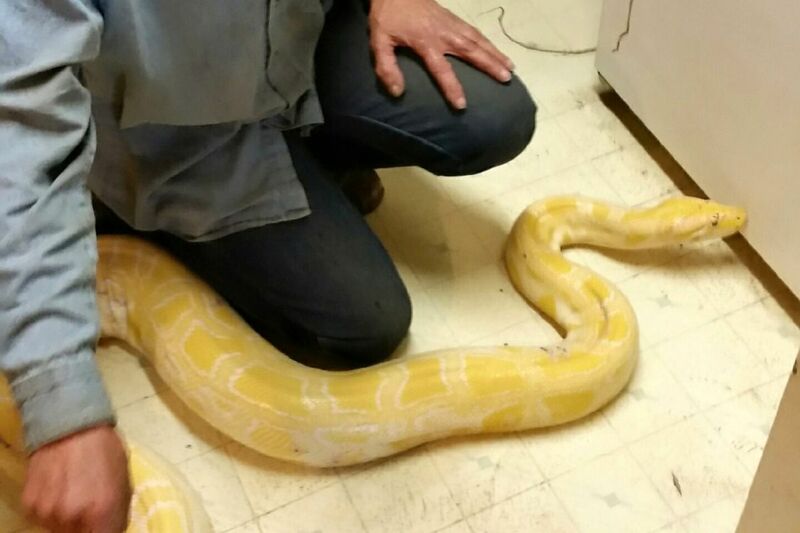 The 100-pound Burmese python's disappearance prompted Matanuska-Susitna Borough officials to issue an alert to residents about the animal. Hyde first reported Sam missing in the area of West Mallard Lane, and the borough's statement encouraged residents in the area of South Rainbow Street and West Swan Drive to be on the lookout; Hyde went door to door telling his neighbors. The only potential sign of the traveling snake came when searchers discovered some molted snake skin in a neighbor's disassembled RV. Mat-Su Borough spokeswoman Patty Sullivan sent out an alert Monday noting the snake's reappearance and a "dark turn" in the search for the animal when "a 4-year-old was reported missing in the neighborhood, and an Alaska State Trooper was on scene. But the child was found safely, and the snake's trail of evidence grew cold, until today." Sullivan said Sam was not only a local subject of intrigue, but inquires about the snake's whereabouts spread nationwide and beyond to German media. When asked if nearby residents' fears should be alleviated with Sam's return, Hyde said they had nothing to worry about. "He's not vicious or evil. He's just shy and hungry."